Students from Eastern Washington University and the University of Missouri (USA), and the University of Sidney (Australia) participated in this year’s excavations in Rantidi Forest. 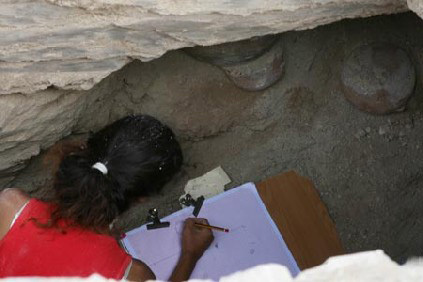 The 2012 Rantidi Forest Excavations (Cyprus) were conducted from the 30th July until the 31st August 2012 under the direction of Dr. Georgia Bonny Bazemore, the Jeffers R. Chertok Professor of Ancient History at Eastern Washington University, USA. This year’s participants included students from Eastern Washington University and the University of Missouri in St. Louis in the USA, and the University of Sidney in Australia. A decade of survey and excavation has located several major sites in the Rantidi forest, located six kilometers to the east of ancient Pafos. The primary site under investigation is the sanctuary complex located on the hilltop of “Lingrin tou Dhigeni”. This sanctuary boasted an important cult of the male deity of prophecy, who was also the consort of the goddess Aphrodite. Thousands of life-sized and over life-size terracotta statue fragments have been recovered here, as well as more than 200 inscriptions in the writing system unique to Cyprus, the so-called syllabary. A large sacred forest extended from the temple boundaries to the coast. The sanctuary both contains and is surrounded by numerous tombs. This finding supports the death and resurrection attributes associated with the ancient consort of Aphrodite, Adonis. Survey this year revealed extensive medieval remains located at the eastern area of the Rantidi Forest known as “Lakkos tou Frankou”. Scatters of dressed building stone and at least one partially standing wall were recorded. These areas have produced large numbers of sgraffito ware, the very fine, highly decorated glazed pottery which characterizes this time period, associated with numbers of large pithoi fragments, indicating the storage of necessary food items. These new findings correlate well with the medieval remains found earlier at the western end of the Rantidi Forest, where a small medieval settlement existed; today, this area lies beneath a hotel and golf club. The results of the Rantidi Forest Excavations indicate that the medieval activity in ancient Pafos, attested by the castle keep which is now the museum of Kouklia, and the adjacent sugar mill, extended to the south and east into the Rantidi Forest. This medieval presence at “Lakkos tou Frangou” may have been defensive in nature, guarding the only route which existed at that time which accessed the Pafian region.